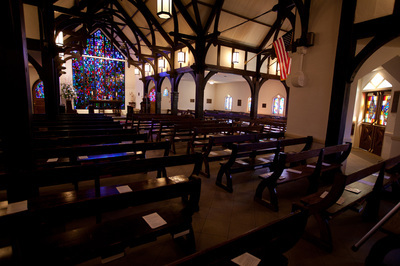 The new organ has been designed to lead the singing of the 525 boys who worship several times each week in the chapel, and it is also used at the many weddings, baptisms, and funerals of members of the school family. Its versatility is demonstrated in the diverse sonorities which are suitable for performances of music from all periods. Of the five organs on the Cathedral Close, it is the only tracker instrument. This instrument is situated in an apse at the rear of the Little Sanctuary of St. Albans School. The casework, fashioned from white oak, has a recessed console with paneled doors, and keyboards having bone naturals and ebony accidentals. The 70% polished tin façade pipes have Roman forms, and a hand-carved polychromed replica of the school shield rests at the base of the central tower. Directly above the console, the Regal pipes are placed on a separate chest and speak through a carved wooden grille. A single bellows provides flexible winding. Because the Swell is located behind the Great and at the same level, tuning discrepancies have been minimized. 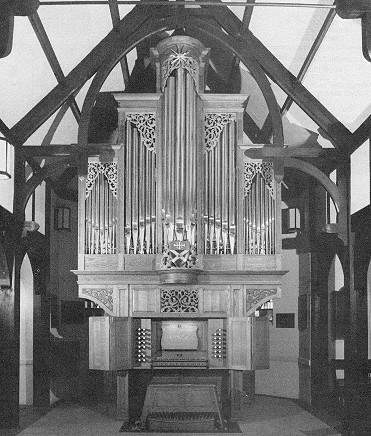 The organ was made possible through a major gift from the Rev. D. Stuart Dunnan, a 1977 graduate of the school, and his parents, in memory of Donald R. Baldwin. The dedicatory weekend took place April 25-26, 1988, and began with a recital by Richard Clemmitt, an alumnus of St. Albans and of the New England Conservatory. The following afternoon, the organ was blessed at a Festival Evensong featuring the school's Madrigal Singers in Britten's Rejoice in the Lamb and the premiere of an organ prelude entitled Elegy, composed for the occasion by Richard Roeckelein, chapel organist and chairman of the music department of the Cathedral Schools. That evening, music for organ and brass was played by William Niel and members of the National Symphony Orchestra.